Highland Dancers perform during the 2014 Walled City Tattoo at Ebrington Square. Picture Martin McKeown. Inpresspics.com. The Walled City Tattoo is to return this year after a gap of a year. But, sadly, it is not returning its traditional home of Ebrington, but instead will be an indoor show at the Millennium Forum in May. Organisers, though, say that will not cut back on their ambitious production which will have 250 performers. The show will feature - as it did in 2013 and 2014 - the Massed Pipes and Drums and the Walled City Tattoo Highland and Irish Dancers. Tattoo Chairman James Kee said he was delighted to be bringing back the Tattoo after missing out last year. “I am elated to be in a position to confirm the return of the Walled City Tattoo,” he said. 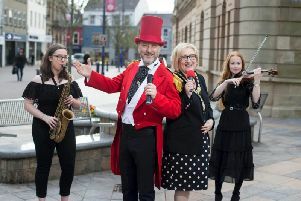 “This event was one of the highlight events during the 2013 City of Culture Year, by returning to the stage we’re emphasising our belief that we can play a key role in creating a legacy from that year which we can all be proud of. Mr Kee added that the decision to moving indoors will change the dynamic of the show. “Collectively as a team we looked at some of the successes and some of the challenges over the last few years with the Tattoo here and we believe by producing an ‘In Concert’ version we can maximise the experience for our audience as well as appealing to a new audience at the same time. “Make no mistake, this is a huge production with a cast of over 250 people so we’re confident we will put on a show that will amaze our audience. Tickets are available to purchase now and are priced from £17.